On the Days of the Year calendar, today we are celebrating "Homemade Bread Day," "Baklava Day," and because then we need it, "Take a Hike Day!" Since we can't hike here atm because of the smoke, we'll just call it, "International Celebrate Carbs Day!" But more important than any of those, today is our favorite son's birthday! Happy Birthday, Dan, and many, many more! And because I didn't acknowledge my favorite daughter-in-law's birthday on October 1, I'd like to do that now, too. Happy Birthday, Rachel, and many, many more! Your birthdays are even more cherished now! For these cards, the wreath I used for both designs is "Cascadia Wreath" by Memory Box. In case you think the camera played tricks, the colors of the card bases are honestly white and cream. I thought we could all use our vivid imaginations and pretend those flowers are poinsettias, so my first design is a Christmas card, kept uber simple with white-one-white, pops of red, and a schplash of silver. The sediment is from The Ton. 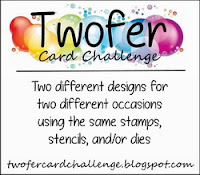 I'm entering this card in the TIME OUT photo inspiration challenge: red, white, gray. I'm pretty chuffed with how this turned out. It was one of those one-thing-leads-to-another card designs. I ended up using a perfume bottle clear stamp from The Alley Way Stamps for the pretty Ziggified vase. I've had it at least four years, but it was still NBUS cuz I've just never had occasion to make a card with a large perfume bottle. As I was looking through my schtuff, I thought the bottom of the perfume bottle would work as a vase, so I put on my surgical gown and operated on it to remove the atomizer dealiebob. The card base is die-cut from an MFT stitched rectangle out of beautiful schparkle paper from SU that was a gift from my friend Brenda. The NBUS sediment from Kaiser Craft is heat-embossed in silver and in Hammy's absence, I winked the vase all by myselves. Sorry I forgot to take a photo closeup to show you all the shimmer and sheen. I also forgot to add a shadow to ground my vase. Okay, let's just move on. Little Red Wagon: Remember when. For this Twofer set, I leaned towards rustic and used a wreath from Papertrey Ink called, "Cutaway Tags: Summer." Making another Christmas card for the pile, I die-cut the wreath from a snippet of gold-embossed Bazzill paper and added another strip behind the wreath. Then I covered the sediment strip part of the die with paper that matched the card base, onto which I heat-embossed the sediment from PTI in gold. To finish it off, I flung gold schplatters all over it with Wild Abandon. 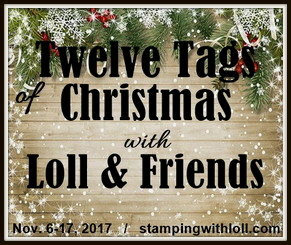 Simon Says Stamp Wednesday Challenge: All that glitters is gold. 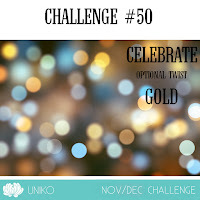 Uniko: Celebrate. Optional twist: GOLD. For my second design, I deconstructed the wreath, using the center sediment strip and some of the flowers, which I colored with my Zigs and winked. The sediment is NBUS from the same set. I found the cool woodgrained background paper in the same stash where I found the paper I used on my first set of Twofer wreaths last week. It feels great to have used these cool patterned papers after years stuck in a drawer! The Twofer Card Challenge is open until November 24th, so you still have time to put your thinking caps on and play along! I have to say, once I got into it, it was really fun thinking of two ways to use a wreath that weren't the same underlying design. It's all win-win for you as you end up with two cards for your stash and it's all win-win for us as we benefit from how you inspire us! 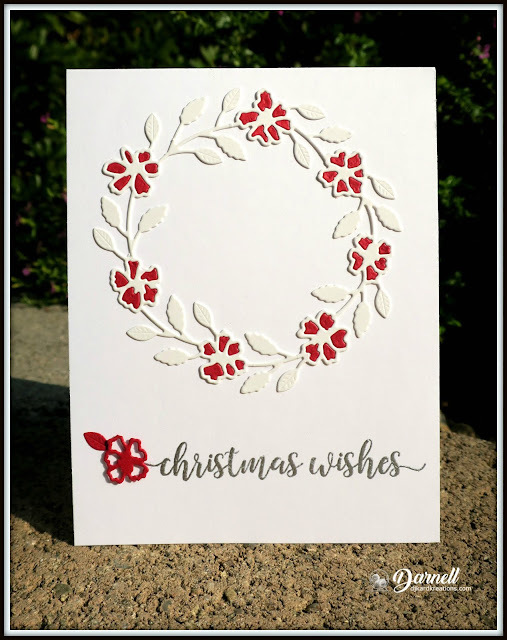 Loving all of these great wreath cards - you are SO creative with using your wreath supplies! I hope the quality of the air you breathe improves soon. Smelling home made bread would a a welcome change from the smoke I'm sure! Happy Thanksgiving hugs to you and yours! Hi Darnell, Love all the cards, but particularly the Peace Joy Love one. I love these beautiful cards, Darnell. Love all your tips about how to put them together. Once again you prove your crafty talents are superb. So sorry about the lives and damage from the horrific fires. Enjoy some baklava for me!! I don't know why you are hiking to the atm machine but if you do, be sure to wear a mask. Not to rob it but to keep the smoke out. I love the first set of red and white wreaths. Very cute to use that "vase" and the wreath made a perfect sprig of flowers. Your partial wreath in gold is beautiful and cutting out the flowers was brilliant to make the second one. Love that wood grain background. Happy birthday to Dan and Rachel. You have some pretty amazing and craftily creative cards here, Darnell! It would be hard not to hoard that wood grain paper. Looks like it has some texture. 'Fraid I'm a wood grain paper addict. 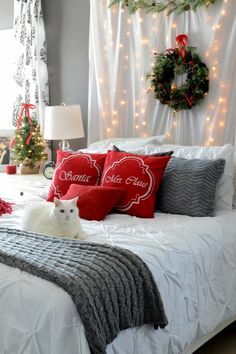 Your red and white looks perfect as a Christmas card! I wouldn't even question it. All kinds of flowers are used in Christmas arrangements. And, wow, so pretty as flowering branches in a vase! I have the cutest stamp of perfume bottles lined up in a row, and I can never think how to use it, either. One bottle says "love" on it. Actually, your "friends are the essence of life" sentiment would be perfect. Finished my wreath cards and will post on Monday. Wow! All those cards with only two products. You win the productive part of this comment...I'm sure you'll also win a couple of challenges with these beauties. That surgery really paid off for the first two and love that you were able to use snippets and pp for the second pair. Holy Smokes!!.... oh sorry wrong words to use : ( I mean WOWie!! 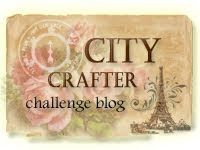 your cards are amazing and your wonderful challenge so inspiring! 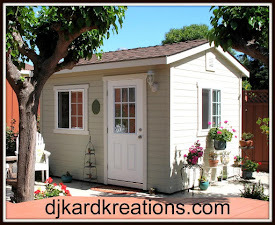 It is wonderful to see the versatility of these products we love to horde!! 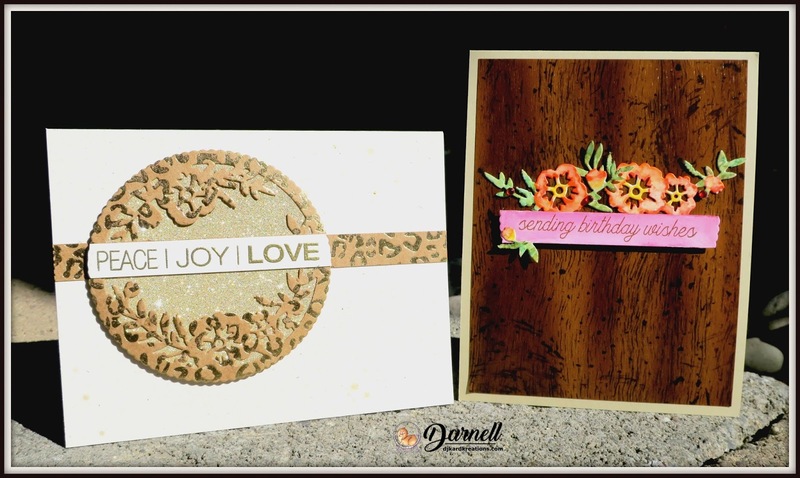 I love how light and delicate your first two cards are, just wonderful Darnell! The second two have a elegant look to them. Fabulous cards, as always. Enjoy those cards LOL!! Great cards, Darnell, but I particularly love the first one. Both are so pretty. More stunning samples for the challenge Darnell. I love how you got the flower stalks for the second card. You know I am partial to the blooms. You should be chuffed! Not only did you do successful and creative surgery, but you winked all by yourself! I'm wondering where Hammy is? Certainly he's not out and about with all that smoke! I'm hoping to get my wreaths out. Wish I had time to use them all! Your metalica look is gorgeous. I like the wreath look too. Hope you are okay with all the smoke. Off to Mexico, Nicaragua, Honduras, Costa Rica and through the Panama Canal. With the way things are going I wonder if I will get off the ship. BUT I packed stamped images and zigs and my copics, not to mention RummyQ and a load of books on my Kindle. Gorgeous-- all of them. Clever way to use the wreath stamps. I hope they get those fires under control soon. What a tragedy. You are on a roll, Dolly! 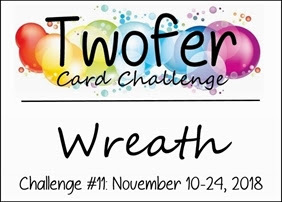 Two sets of Twofer wreath cards ... AWESOME. LOVE the beautiful Christmas wreath. So clever ... really do look like poinsettias because of the sentiment. :) Love the way you've created your second card with the awesome perfume bottle. Double clever!! Second set ... again, beautiful die-cut wreath used to create two completely different cards. Had to take a hard look to see that it really was the same on both cards. Love the shiny, beautiful Christmas wreath. With wild abandonment is the only way to fling gold around. 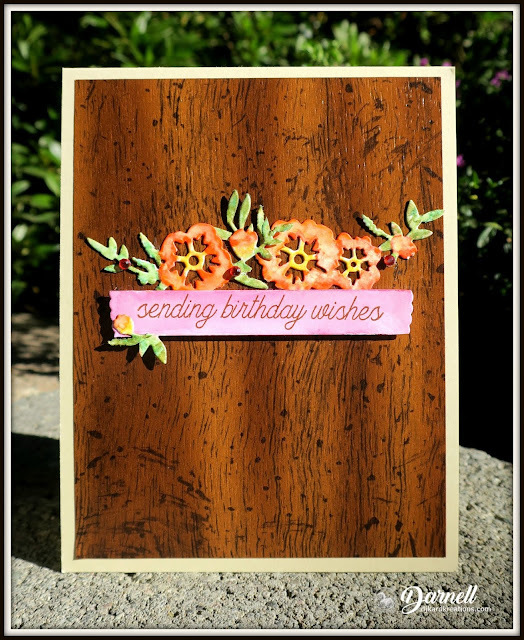 :) Fantastic birthday card with the pretty floral spray and woodgrain background. Genius cards, my friend! Love, Lolly PS HB Dan, HBB Rachel! truly beautiful cards Darnell, of course that first one is a poinsettia just like my blue colouring of my flower is a natural colour. In our garden they can look like anything we want. I love both the wreath and the vase of flowers so elegant and pretty. Okay, Darnell, I'd like to see you "schplattering" gold spots on your card "with abandon." And then I'd like to join you in some of that schplattering. Okay, down to business...your cards are awesome! And they all show so much creativity...your mind definitely works in mysterious ways. Wonderfully mysterious ways. Your array of handmade Christmas cards must be awe-inspiring! Ooooh, I used to love baklava... I am sure even the thought of it now has put 2 pounds on me - lol! I never cease to be amazed at how one die/stamp can look so different. Your first two cards are beautiful, I just love how you used the perfume bottle, it really does look like a lovely vase... The second pair are wonderful, I love that wood grain backing paper and your deconstructed design looks so beautiful. I hope the smoke is not too bad and that you are having a good weekend. Darnell, your cards are just stunning! I love your two-fer cards! You find always so clever solutions! Fabulous all the cards and that vase made with a perfume bottle stamp is so cute!!! Sorry but I'm in hurry! Big hugs! Fun twofer! Creative way to use a wreath image on your CTD card!!! So happy you joined us! Fabulous batch of cards, Darnell - especially love the deconstructed wreath on the woodgrain, but they're all gorgeous!! Speaking of surgery on a stamp, I tried to do it on a clear snowflake wreath (to cut sentiment from center) - dang thing is self healing, I think. I couldn't get it cut! Sorry how the fires are still affecting you out there. Thinking of you!! I've been checking the air quality for you & my sister--not good! Hoping the weather gives some relief soon. You are on a roll with your card, Darnell--wow! All lovely, but oh my goodness--cutting apart the wreath to use in your constructed vase is a jaw dropper! Wishing you & your family a wonderful Thanksgiving! If I could I would help you with fresh air without smoke. I hope it will rain soon. What a creative use of the Memory Box wreath, Darnell! 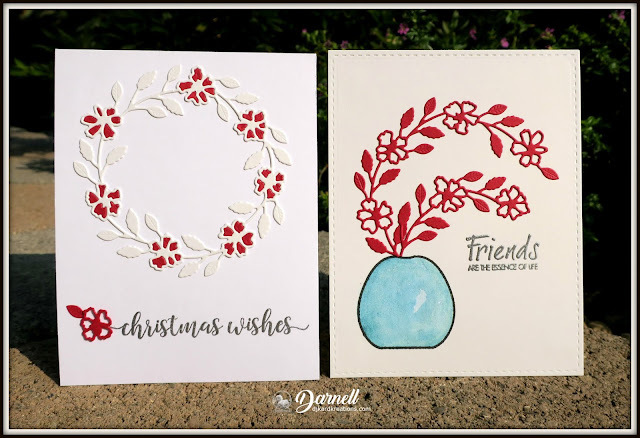 Your flower cards, I mean poinsettias, look like they were made with two distinct dies. 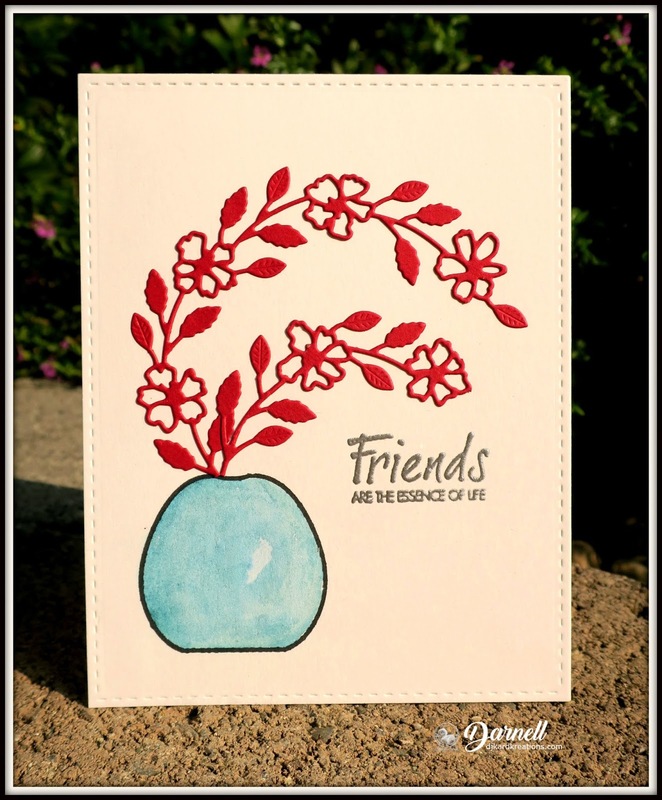 Fortunately you decided to create another twofer with different supplies, because I just LOVE the card with woodgrain background... how beautiful! Before I leave your virtual Playhouse (to me, of course), I would like to send a Happy Birthday, and many more, to your favorite son and daughter-in-law. I will have to remember your word NBUS. That's really what the challenge at Little Red Wagon was this week and you captured it perfectly with your vase card. Thanks so much for joining us. Jaw drop here Darnell - these are all so lovely! How about you send Hammy here for a while and I send Dudley to you? That way I might get things done! These are so clever Darnell, if I hadn't seen the wreaths I wouldn't have known that's what they were part of!! Your red and white wreath is so beautifully CAS and I adore how you used it in red with the vase. And the second pair of cards are uber gorgeous, especially love the woodgrain paper behind the second one with the pretty flowers. Your a marvel and its always wonderful to see you at TIME OUT!! A whole set of unique cards. Darnell, you give so much inspiration that the wreath can also be something else. It's amazing how you were able to give new meaning to the wreath. Wonderful cards, an amazing challenge. Love the wood grain paper in the last one. Whoa...all of your cards are beautiful but the ones with that first wreath die are amazing. Look at how clever you are, turning the wreath into a spray of flowers! Love the red, white and turquoise colors for a really clean and fresh look. Amazing inspiration here Darnell! Great use of dies! You've created such an unique card with the parfum bottle vase and those die cut flowers. Love the inlaid die cut technique in your first card too, very beautiful. The red really pops from the all white card. Thanks for joining us at TIME OUT! Gorgeous! Great use of dies, lovethe wreaths. Thanks for playing at AAA Cards. Oops not concentrating, meant Thanks for playing at Uniko! Sorry I'm so late to the party, been a little under the weather and just catching up with commenting. 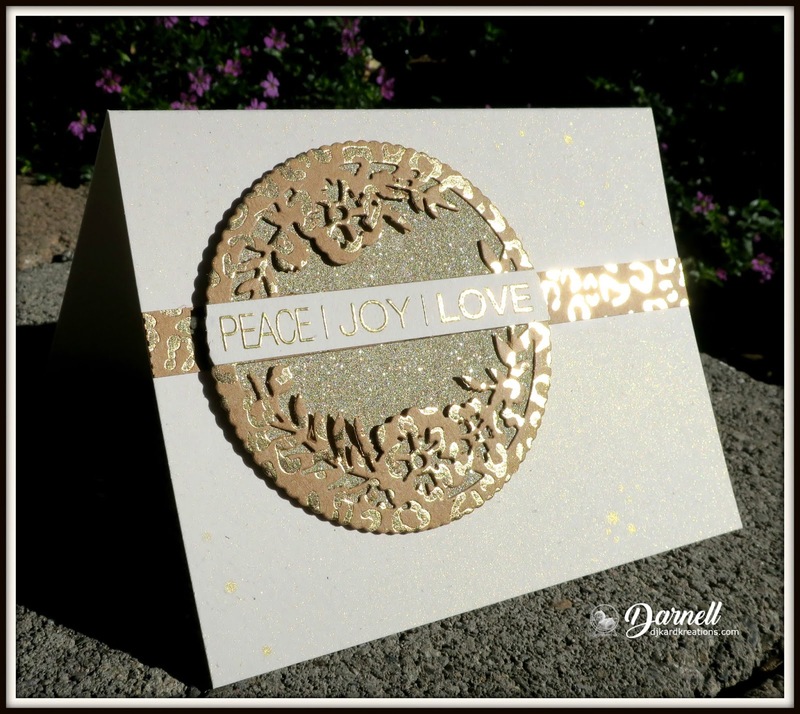 Your second wreath die looks great as a Christmas card, the snippets of gold look really festive. The second in contrast works so well as a fall card. Your destruction, oops I mean de-construction, of the wreaths for your second cards was a brilliant idea, Darnell. Ooops! .... I'm a little late with my comments this month. Two fabulous Twofer's though. 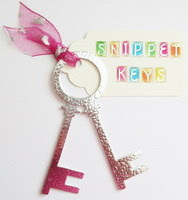 I'm always amazed how you get your different designs using the same products .... very clever. Love the pretty wreath on the first set, and the rustic look for the second is just gorgeous.